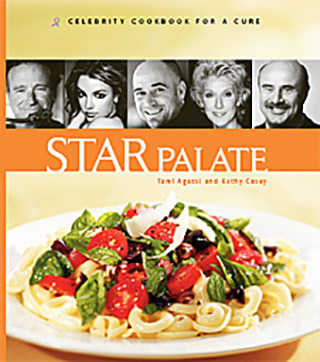 Star Palate is a collection of treasured recipes from some of the most noted and beloved celebrities of our time. The 80 recipes are personal and family favorites shared by stars from all walks of life, from pop culture and music to sports, business, and the food world. Stars such as Robin Williams, Britney Spears, Andre Agassi, Jay Leno, and Pierce Brosnan share their favorite dishes for a great cause. Produced to support ovarian and breast cancer research through the Marsha Rivkin Center for Ovarian Cancer Research and the Breast Cancer Research Foundation.